3dcart allows you to easily setup your online store by importing and exporting the bulk of your current store information. Such information includes customers, products, product options, and images. Exported CSV files can then be edited and formatted for importing back into the store. This guide will give you a step-by-step process on how to export all of your product information. Look towards the left hand side of the page and click on the +Icon next to "Products"
Next, click on the "Export Data" link to generate your store's product CSV file. This file will list all of the various attributes of your product (name, price, image paths, etc) in a text file with commas separating each entry. While it is technically just a text file, the comma separated values (CSV) allow the file to be imported and read in a spreadsheet program so that it appears in rows and columns. This file may be edited as needed and then saved for importing updates to your store. Just follow the same steps as above to import items, but look to the right hand side of the page for your Import options. In the next section, we'll go over the various column headers found in the CSV file and how they pertain to your product's information. This is the unique manufacturer id that may be provided by the manufacturer of the product or assigned by you. This is the name of the Distributor this product is associated with. This is the base cost of your product, it's for internal use. This is the MSRP or Retail Price of the product. If this is added to the product then the Savings will be displayed to the customer. The price of the product when it is on sale. Lets you know if the product is on sale. 1 for yes, 0 for no. Displays the amount of stock that needs to be left before a stock alert is generated. Minimum amount of the product the customer needs to purchase to checkout. This is the Description of the product. 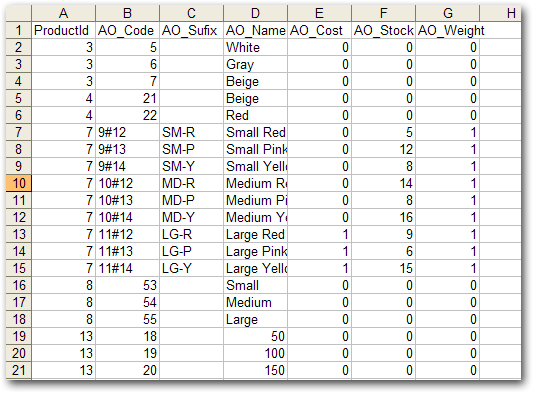 This determines the products order or sorting inside the Categories. This is the path to the main images used for the product. This column defines the related products for this product. This adds a handling fee to the product. This fee is added to any shipping methods that you have set. This marks the product as a home special which means that the system places this product on your home page. 1 means home special, 0 means not a home special. This marks the product as a category special which means that the system places this product on top of the Category that it is in. 1 for category special, 0 not a category special. This hides the product from the website. 1 hidden. 0 for the product to be visible. This marks the product as free shipping. 1 for free shipping, 0 for paid shipping. This defines the title of the product in the web browser. By default the system will use the product name. Displays the meta tags of the product. 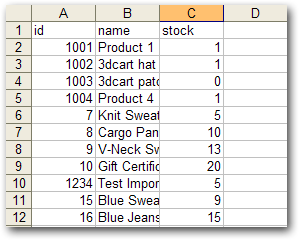 The main product export function will allow you to export all of your product's basic data in one large CSV file. However, you may have an export need where you only need a small number of editable CSV areas. For this purpose, we've create the Custom Export Sets which allow you to specifically dictate which product columns are included in the exported CSV file. Next, click on the "Custom Export Set" link to review your custom export settings. Click the "+Add New" button at the top right of the page. Type the name of your custom export in the Set Name section. The next steps will involve desgnating which of the CSV columns you will need for the export file. These can be added using the "Add New Field" drop down menu at the top of the page. Add the categories of information you would like in your export in the Add New Field. Once you have chosen the Information fields you would like to include in your export, you can then edit them as needed for your own purposes. For example, you may need to create an export file for a drop shipper who - rather than referring to the item's name as "name" - needs to have that specific column labeled something different. Or perhaps, the dropshipper's interface doesn't recognize comma separated values in the file, but rather tab delimited. Either way, we offer some control as to how the export file itself is generated for you. Please be aware that the customization options below will only be useful for situations where you need to export data from your store in a format that will ultimately be imported or used in an external inerface. If you plan on exporting CSV data from your 3dcart store for importing back to your 3dcart store at a later time, you do not need to change any of its native formatting. These first options will let you determine how the custom export itself is formatted. The name of your custom export set as set in step 6 above. Example: Changing the "Depth" header column so that it says "Length"
Text entered here will be added to the beginning of the data in the CSV file. Example: Adding "$" as the prefix for "Price" will write the data in the CSV as an actual dollar amount instead of the numerical value. Text entered here will be added to the end of the data in the CSV file. Example: "-In stock" as the suffix for the "stock" field will write the data in the cell as "[number]-In Stock"
The action wheel fond at the far right of the field editor will allow you to delete a field if needed. Click on the "Save" button located at the top right once you have finished customizing your export. Click Back until you reach the Export/Import page. Now, you should see the custom export set (that you just created) in the "Custom Export Sets" section. The generated CSV file will now match your specified custom export criteria. Click here for more information on creating a custom export. You can also export your product's current option sets as needed. Look towards the left hand side of the page and click on the +Icon next to "Products Options "
Next, click on the "Export Data" link to generate your store's product options CSV file. This file will list all of the various attributes of your product options. Unique database ID to keep track of the option in the backend. Shows which category this option is assigned to. Only refers to options that are input in the "Global Product Options" section of a category. The type of the option – describes how the option is displayed to customers. Shows if the option is required to be chosen for checkout. 1 means yes, 0 means no. Shows the sorting number for the option. Lower numbers will display before higher numbers for products with multiple options. Unique database ID to keep track of the feature in the backend. This is not the same as optionid. These are the names of your options. The price of the options. Shows the sorting number for multiple options within the same feature. Lower numbers will display before higher numbers. Shows the part number of the option. Shows the path of the image used if the option displays using the dropimage type. Shows if the option is hidden from customer view. 1 means yes, 0 means no. Along with regular optins, you can also export your product's Advanced Option sets as needed. Look towards the left hand side of the page and click on the +Icon next to "Advanced Options "
This file will list all of the various attributes of your advanced options. This is the unique Catalogid of the Product. 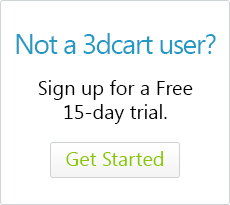 This number was automatically generated by 3dcart when the product was initially entered into the system. This is a unique database ID that will be used to keep track of each advanced option in the backend of the system. This is the part number of the advanced option. The name of your advanced option. The additional price of your advanced options. The stock number of your advanced option products. The weight of your advanced option products. If your items use bulk discount pricing, you can also export this data as needed. Look towards the left hand side of the page and click on the +Icon next to "Bulk Pricing "
Next, click on the "Export Data" link to generate your store's bulk pricing CSV file. This is the low end of your range (number of products) for customers to receive bulk discounts. This is the high end of your range (number of products) for customers to receive bulk discounts. This is the discount amount the customer will receive if they are applicable for the bulk discount. Shows if the discount is a percentage – 1 for yes, 0 for no. Shows which customer group/price level receives the bulk discount. If none are specified, the default will be 1. Need to export your store's product inventory information? We've got you covered here as well. Look towards the left hand side of the page and click on the +Icon next to "Products Inventory"
Next, click on the "Export Data" link to generate your inventory CSV file. This is the unique product id (SKU or Part Number) of the product. This is the stock number of the product. Look towards the right hand side of the page and click on the +Icon next to "Image Gallery "
This is a unique database ID that will be used to keep track of each image in the backend of the system. Item Part Number or ID as the unique identifier to add the images to. Database ID for the product as the unique identifier to add the images to. path to the image that has been added to the image gallery, i.e. "assets/images/default.jpg". text caption for the image, it displays on the top section of the image gallery. sort order for the images inside the gallery.